Today is the beginning of a new lesson. These lemons, or limes, were in a glass bowl at the Art and Antique Studio Gallery, where I work and teach. I'm not sure if they were green lemons or ripe limes, so I'll just call them lemons for now. The principles we will use for this painting will work either way. If you would like to paint along with this lesson, for five dollars you can go to my etsy webstore and order the photo reference and drawing by clicking on the online class icon. Once your payment clears, I will send you the photo and drawing via email. Several people have said they printed out the lesson each day, and then they had the whole plan before they started. It has been fun to see the pieces that people have produced from my blog lessons! The first thing I did was prepare a drawing from my photo references. I used graphite to coat the back of my drawing and then I taped it on one edge to a 10 by 14-inch piece of Arches 140 pound cold press paper. 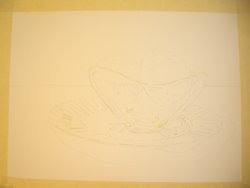 Next, I masked the areas in the bowl and plate where I wanted to protect the white of the paper. It is very important to apply masking thoughtfully. 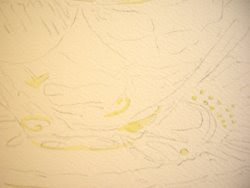 Whatever marks you use with the masking fluid will remain when you lift the masking later in the painting process.